The semiarid region just north of the Black Hills in western South Dakota has vast stretches of tablelands with agricultural potential. Carefully monitored irrigation is necessary for this region to thrive due to its differing needs. The land north of the Belle Fourche River comprises mainly sticky gumbo soil that retains water. Without proper drainage, excess water seeps into the subsoils, salts rise to the surface, and the area is no longer able to be irrigated. The land south of the Belle Fourche River, on the other hand, has thirsty sandy loam that requires frequent watering. 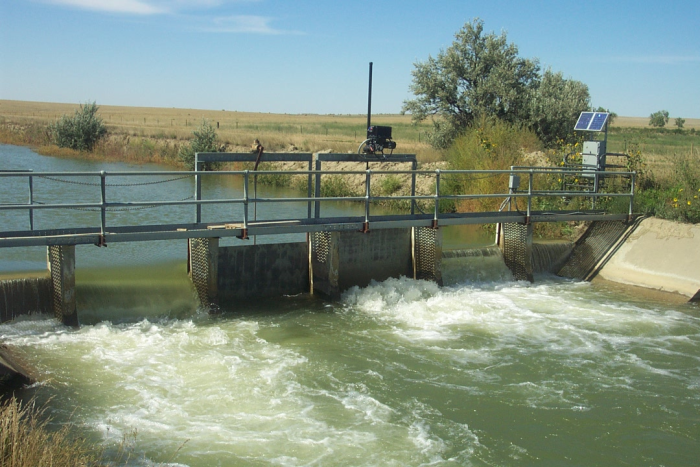 In recognition of this region’s complex irrigation needs, the Bureau of Reclamation established the Belle Fourche Irrigation District (BFID). BFID is responsible for the care, operation, and maintenance of an irrigation system that delivers water to over 202 km2 (50,000 acres) of cropland, using 94 miles of main canal, 450 miles of open lateral ditches, and several dams. Because this region faces recurring drought, water conservation is critical to ensuring a sufficient, available supply for irrigation needs throughout the district. BFID wanted to reduce their canal water-level fluctuations, thereby reducing water loss and increasing delivery efficiency. To accomplish this, it was necessary to automate the BFID’s canal check structures. BFID contracted with RESPEC, an integrated consulting and services firm, to assist with the project coordination, installation, advising, system configuration, and troubleshooting. In 2006, RESPEC began automating the BFID canal check structures. RESPEC installed water level sensors, gate height sensors, and gate actuators in combination with Campbell Scientific dataloggers (CR1000, CR850, and CR200X models). RESPEC has facilitated several automation campaigns over the past 10 years for BFID. RESPEC partnered with Intermountain Environmental (IEI) in 2008 to install about half of the current automated sites and repeater stations. RESPEC continues to maintain and update the automation system. The automated check gates maintain a constant upstream water level throughout the canal system. The desired water level is sustained by the movement of the automated gates up and down in response to level fluctuations. The resultant constant water level promotes more efficient water delivery to farmer turnouts and lateral head gates. If the water level at a particular check structure reaches an elevation that is too far out of range for the gate to control, Campbell Scientific’s LoggerNet software is configured to send an alarm notification via a text message to the irrigation personnel’s cellular phones. Several automated head gates work in combination with a flow measurement structure. When the desired lateral flow is programmed into the datalogger using LoggerNet, the lateral head gate adjusts automatically to deliver that flow. The flow is measured either upstream or downstream of the gate, using Parshall flumes, long-throated flumes, or constant-head orifice structures. A water-level sensor at the flume relays information back to the Campbell Scientific datalogger. RESPEC set up and coordinated an extensive radio communication network across the BFID using RF450 spreadspectrum radios. With this network, selected sites are monitored and controlled in real time from the BFID headquarters in Newell, South Dakota, or from anywhere throughout the BFID using a vehicle-mounted mobile base station. To assess and quantify the benefit from the implemented automated gates, RESPEC conducted an analysis of the Vale Lateral, which is a major lateral on the South Canal. In 2005, before the check gate automation was implemented, the upstream canal level showed fluctuations greater than 1.0 ft. After the Vale gate was automated in 2006, the canal level showed fluctuations within ±0.05 ft. Based on water delivery records, the check gate automation resulted in an 84% improvement in water delivery efficiency. In 2007, a real-time automated head gate and sensors were installed on the Vale Lateral flume. The installation provided the exact, programmed amount of water to be delivered down the lateral, without any waste. The estimated loss reduction is 3,460 acre-feet per year, providing more water for distribution throughout the irrigation system or for recreational purposes at the reservoir. Excess canal water that is not delivered to irrigators moves through the system and out the end of the canal in wasteways. During this process, the water picks up sediments from the canal and return flows from the irrigated land. By reducing the amount of excess water, the amount of sediment is also reduced. With less sediment discharged into the adjacent Belle Fourche River, water quality and the fisheries are improved. The recreation potential is also increased at the Belle Fourche Reservoir (home to the Belle Fourche National Wildlife Refuge and the Rocky Point Recreation Area). Since 2006, RESPEC has automated more than 50 canal check structures using a variety of Campbell Scientific dataloggers and an extensive RF450 radio network. The upgrades to the canal check structures have helped the BFID improve their water delivery efficiency, continue to meet their district’s irrigation needs, and protect a recreational resource for thousands of annual visitors.